With the 2018 NFL draft in the books, excitement and anticipation for the 2018 season is at an all time high. Every season is going to be a winning season in the eyes of the fans for the 32 teams. There is reason for caution however. That caution comes in the shape of the 2013 Draft. Hindsight is a great thing, but five years on we can accurately judge that 2013 was far from a classic, with more Pro Bowl talent coming in the bottom half than in the top half. So for those thinking that their latest first round pick will transform their franchise – think again. Fisher didn’t have the strongest start to his career, and eyebrows were raised when he was picked ahead of Luke Joeckel. In the last few seasons, Fisher has come into his own and is now one of the better Tackle’s in the NFL. In 2016, the Chiefs signaled their intentions and went all in on Fisher, signing him to a 4-year $48m contract. Not bad for a first rounder, but hardly worthy of the first overall pick. Luke Joeckel has unfortunately epitomized the lack of talent that the 2013 Draft produced. Widely regarded as one of the worst Left Tackles during his first three seasons, in 2016 Joeckel was moved inside to Guard in order to make way for the newly acquired Kelvin Beachum. What made the Joeckel pick even worse for the Jaguars is that they traded away Eugene Monroe in order to make way for him. Even with Monroe on the wrong side of 30, he was still performing at a high level. At the end of the 2016 season the Jaguars cut ties with him and he signed a one-year deal with Seattle. 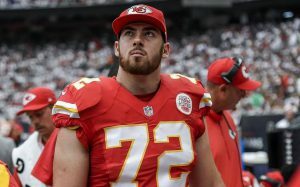 He was allowed to walk at the end of the 2017 as one fifth of one of the worst Offensive Lines in the NFL. He is currently looking for work, but it wouldn’t be unexpected if he didn’t find a job again. Dion Jordan has probably had the wildest ride of any player from this Draft. He started his first season rather inconspicuously with only 2 sacks whilst featuring in all 16 games. In 2014 however the drug issues begun. He missed 6 games that season for two violations. Jordan was then suspended for the entire 2015 season. He didn’t play a game in 2016, and so missed out on two full years of football. Whilst he only played 5 games last season for the Seahawks, he got 4 sacks showing that the talent is still there. As a result the Seahawks placed a first-round tender on him. Jordan will only be 29 by the time the 2018 season starts and with little football tread on his tyres he could play well into his thirties. Johnson was the third Offensive Tackle taken in this Draft and was considered a project compared to Fisher or Joeckel who were more NFL ready. He played his first season as a Right Tackle as the Eagles already had the all-world Jason Peters playing on the left side. Since then he has established himself as one if the premier Right Tackles in the NFL but has let himself down at times with PED suspensions. Ziggy has been everything the Lions hoped he would be, and is arguably the best player picked in the top five of the 2013 Draft. He has been a stalwart at End for them and managed to earn a new 1-year deal this offseason to the tune of $17.1m. Excluding his down year in 2016 where he only got 2 sacks he has fought for 42 sacks in 60 games in his career. Mingo was the third Defensive End taken in the Draft and is also the second disappointing player on the list to now be on the current Seahawks roster. A freak athlete at the college level, when he got to the NFL he was overpowered by the elite level Offensive Tackles that could deal with his speed rushing technique. He has stayed healthy throughout his career and has only missed two games so far, but in that time he has only got 9 sacks. Mingo has been on 4 teams in 5 seasons, which tells us that coaches are still intrigued by the athlete rather than the player. When you are the highest selected Guard since 1986, people would think you are a “can’t miss” prospect destined for Canton, Ohio. The reality for Jonathan Cooper has been anything but that. Cooper, like Mingo, is on his fifth team now and has yet to settle somewhere. Unfortunately for the Guard, his loss of form can mainly be attributed to a broken leg that he suffered in the preseason of his rookie year. In 2016 the Cardinals had seen enough and moved him onto the Patriots as part of the Chandler Jones trade. He ended up being cut by both the Patriots and the Browns before arriving in Dallas where he has a decent season with the Cowboys. This season he will be with the 49ers but he will find it tough to keep his NFL career intact if this latest move doesn’t work out. Tavon Austin hasn’t been a colossal draft bust, but he is still hasn’t lived up to expectations. Austin was the first skill position player picked in 2013 but since then his career has only yielded 1,689 receiving yards and 1,238 rushing yards. Last season with the Rams under Coach McVeigh, he was primarily used as a Running Back rather than a Receiver. One thing that made Austin’s drafting seem even worse is that they gave him a substantial contract just before the start of the 2016 season which ended up hamstringing the team financially at the Receiver position. This offseason, in a bid to save his Rams career, Austin tore up his 4-year $42m deal in exchange for a fully guaranteed 1-year $5m one and has since been traded to the Cowboys. We have had many players that can be considered draft busts so far from the first eight players, but Dee Milliner tops them all. The first of three Alabama players taken in a row was nothing but a disappointment from the first whistle. Many draft analysts had Milliner going even higher than his eventual 9th spot so this was by no means a reach for the hapless Jets. Injuries and poor play were the main reasons behind his demise and by the time the 2016 season came around, the Jets declined to pick up his option. Since then he failed to catch on with another team and hasn’t played a game since 2015. Like Jonathan Cooper, Warmack was supposed to be a safe pick in this draft, but he hasn’t lived up to his draft billing so far. Whilst he hasn’t been a terrible player, he hasn’t really been very good. When it came to the Titans making a decision on his contract option, it would have cost them $11m. That is a hefty price to pay for any Guard, let alone one that isn’t playing at a Pro-Bowl level. He left the Titans for the Eagles and he has been more of a role player than a starter since then, signing only a short-term contract in Philadelphia. The top 10 of the 2013 NFL draft were, in summary, abysmal. The next few picks continued that trend with DJ Fluker (C+) and DJ Hayden (D-) going to the Chargers and Raiders respectively. The mercurial Sheldon Richardson (B) came up next at 13 to the Jets, he has now joined the Vikings to strengthen an already scary Defence. The painfully average Star Lotulelei (C) was picked at 14 by the Panthers, followed by the current free agent Kenny Vaccaro (C+) to the Saints at 15. EJ Manuel (D) was the first Quarterback to be selected, which surprised many as he was considered a huge reach by the Bills. Currently out of the league, Jarvis Jones (F) played only three seasons for the Steelers before being released. Eric Reid (B+) followed at 18 to the 49ers, and whilst he is currently a free agent, his reasons are more political than they are related to his Pro-Bowl talent. Justin Pugh (B) was the penultimate pick of the top-20 and was a pretty decent player for the Giants at Guard. It is from the 20th pick onwards that the 2013 draft began to shine with three Pro Bowlers selected in a row in Kyle Long (A), Tyler Eifert (A-) and Desmond Trufant (A). Unfortunately for Sharrif Floyd (C-), a career threatening knee injury has prevented him from signing with a team this offseason. At 24, Bjorn Werner (F) couldn’t adapt to the NFL and has been out of the league since 2016. Xavier Rhodes (A+) was the Vikings second first round pick and is arguably the best player in the first round. The normally draft-astute Packers made a blunder picking Datone Jones (D+) at 26. DeAndre Hopkins (A+) was an absolute steal for the Texans at 27 and has carried the Texans Offence ever since. Sylvester Williams (C) has been solid if unspectacular throughout his career and now turns out for the Lions after being drafted by the Broncos. Cordarelle Patterson’s (C-) speed intrigues many but his output has always been questionable. He has as good a chance as any to change his fortunes now that he has landed in New England. Alec Ogletree (B+) was recently traded to the Giants but has been a stalwart for the Rams for the last few years. The reason for the trade was more down to freeing up salary cap space for Cooks and Donald than poor performance. The last two picks in the 2013 draft couldn’t have had more contrasting fortunes. Travis Frederick (A+) was considered to have been over drafted by the Cowboys but since then he has been to 4 Pro Bowls and is widely considered one of the best Centre’s in the NFL. Matt Elam (F) is now out of the league due to his legal troubles. His play on the field didn’t warrant a second chance by any team and rightfully so.